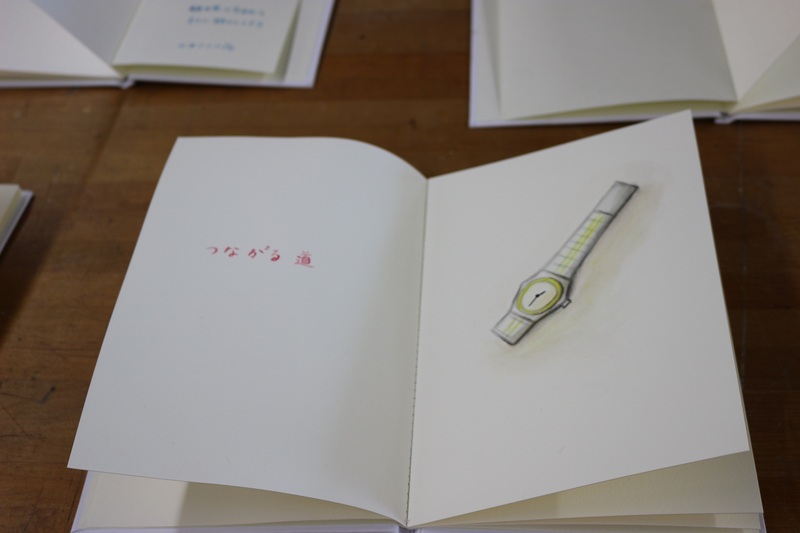 An artist NAGAOKA Daisuke is joining the residence program at Aterie FIdalga in Brazil. 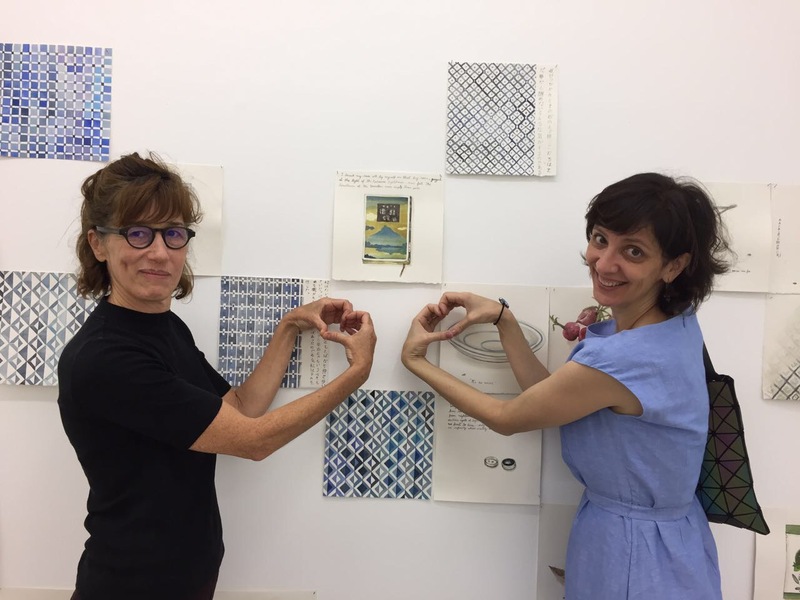 one of the organizer of Atelie fidalga is an artist Sandra CINTO, and both of them joined AIR 2015/Summer “Passage: A Day in Eternity” together. 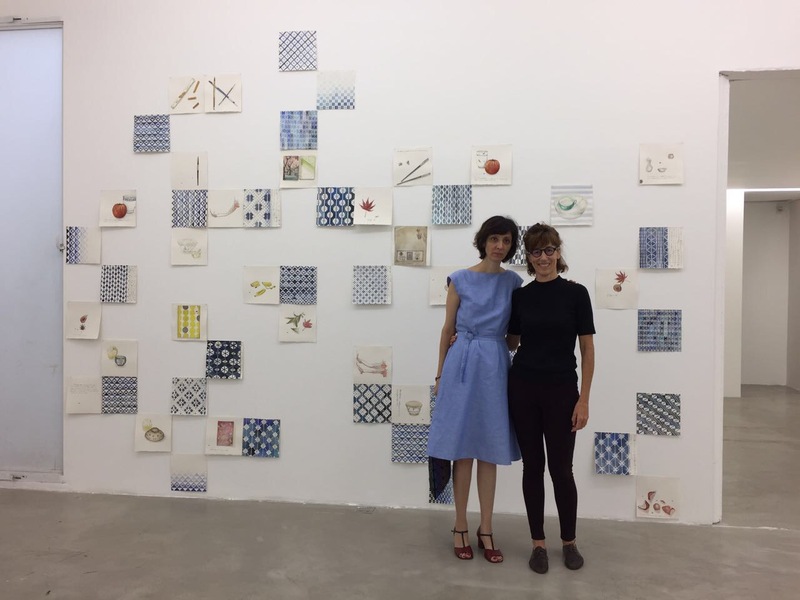 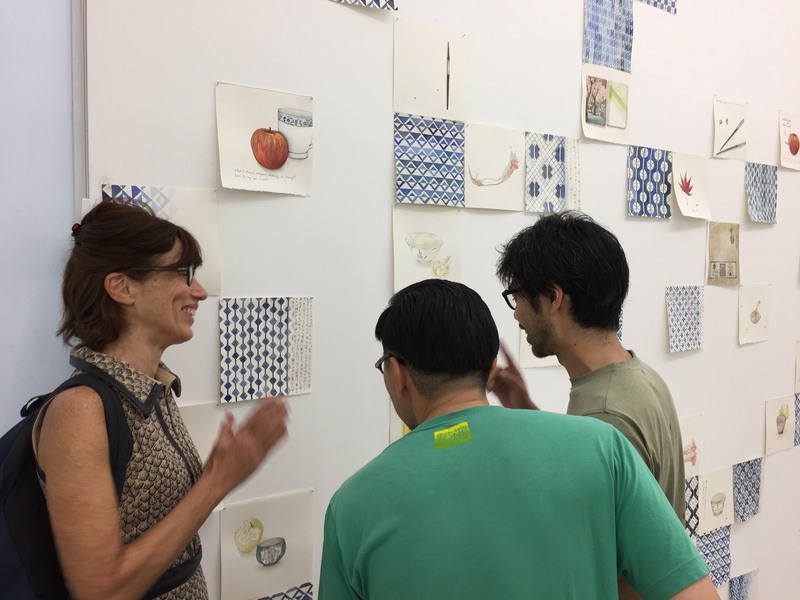 Also, Nagaoka visited the Renata CRUZ’s exhibition (she joined AIR 2016/Autumn “kaetemiru”) in Sao Paulo. 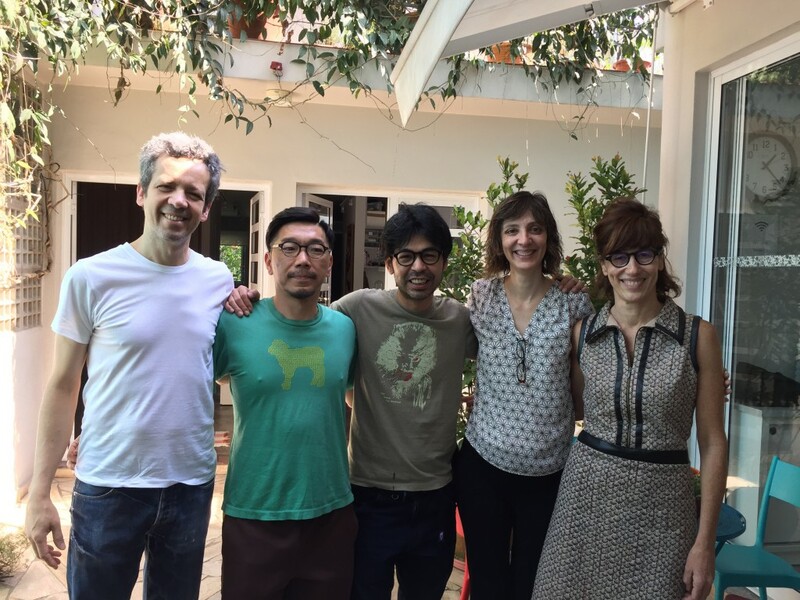 We are really happy to see they keep their friendship. 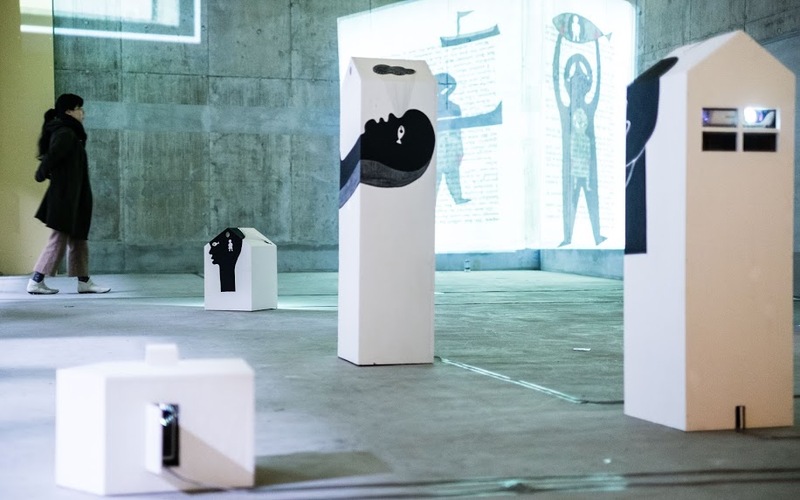 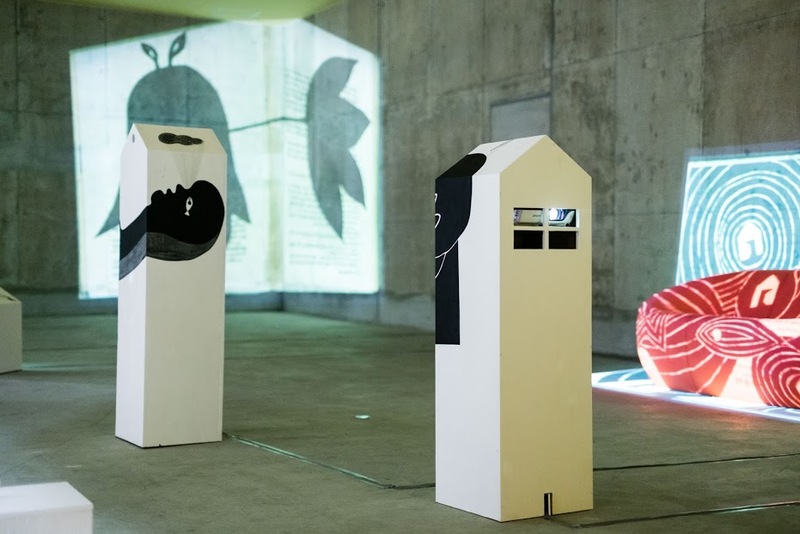 Renata CRUZ who is an artist of AIR2016 “Time For A Change” held a solo exhibition in Brazil. 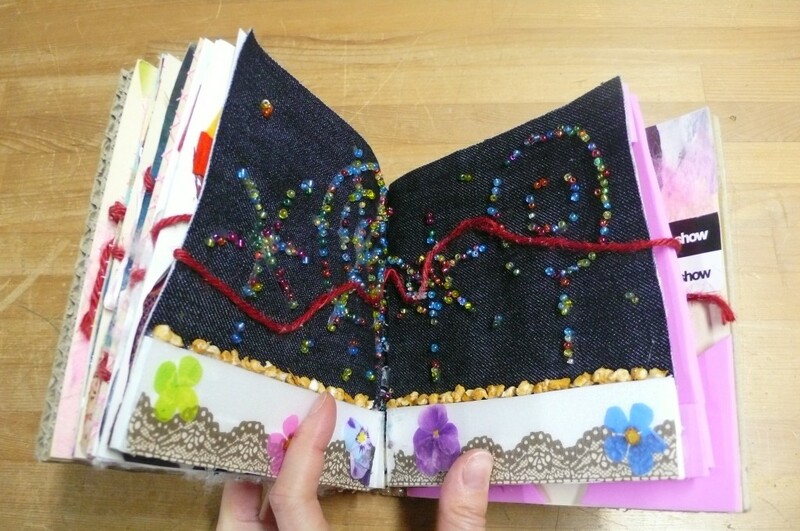 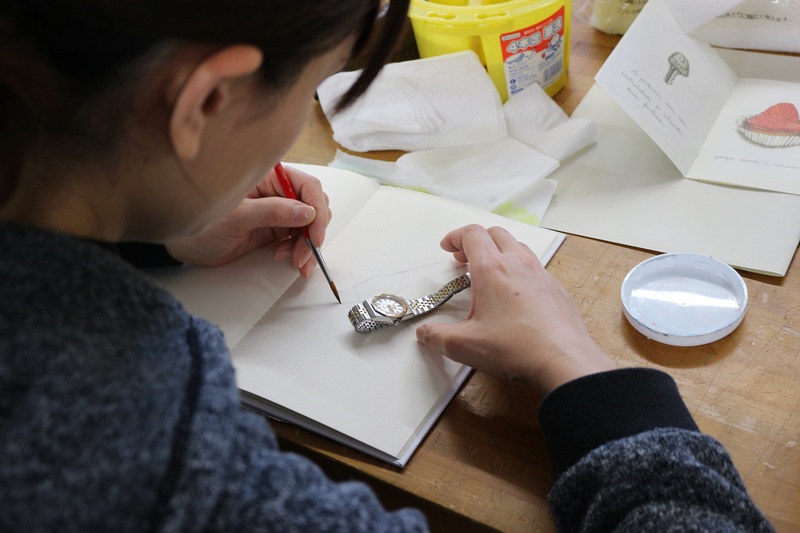 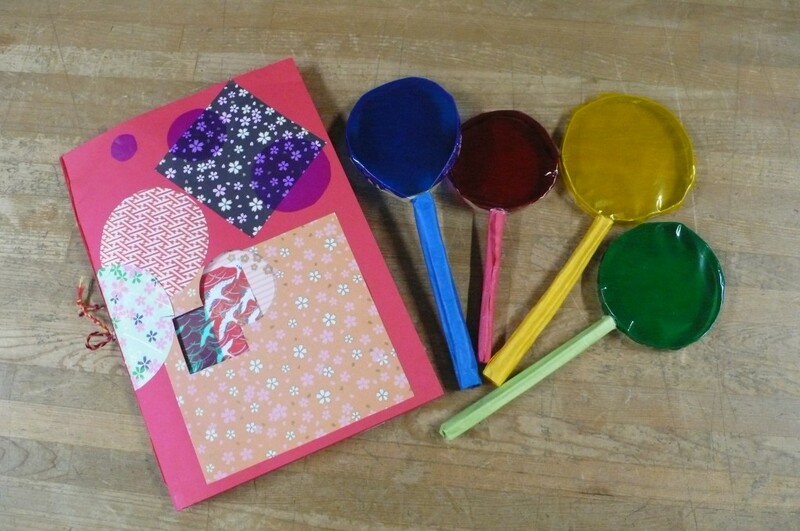 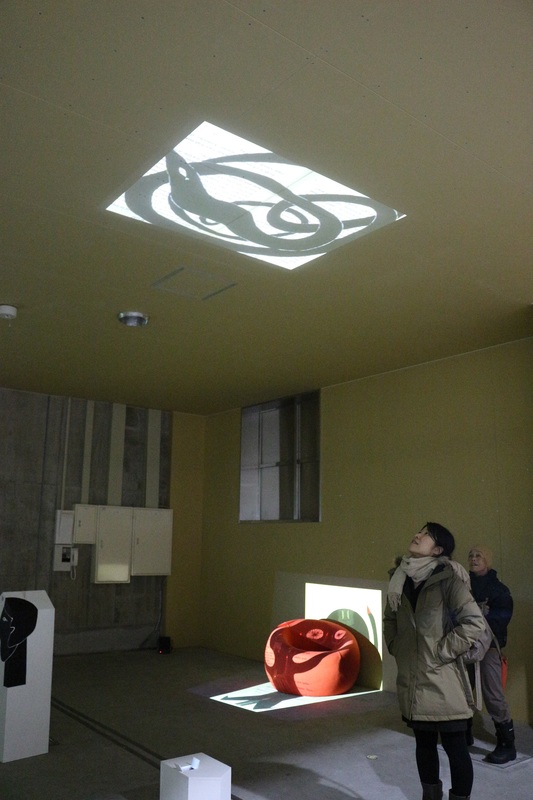 She also showed series of art works motivated by KOGIN which is one of traditional handicrafts in Aomori. 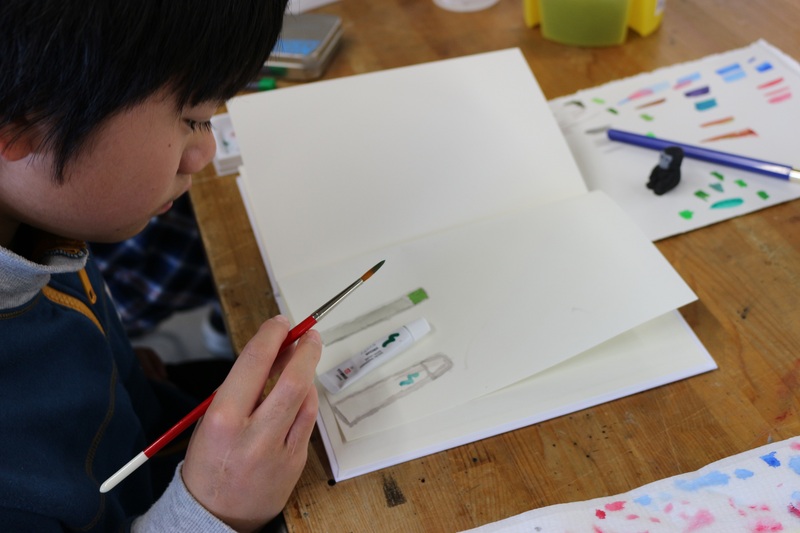 LEE Yen-Hua visited Aomori Chuo Highschool and held the workshop on November. 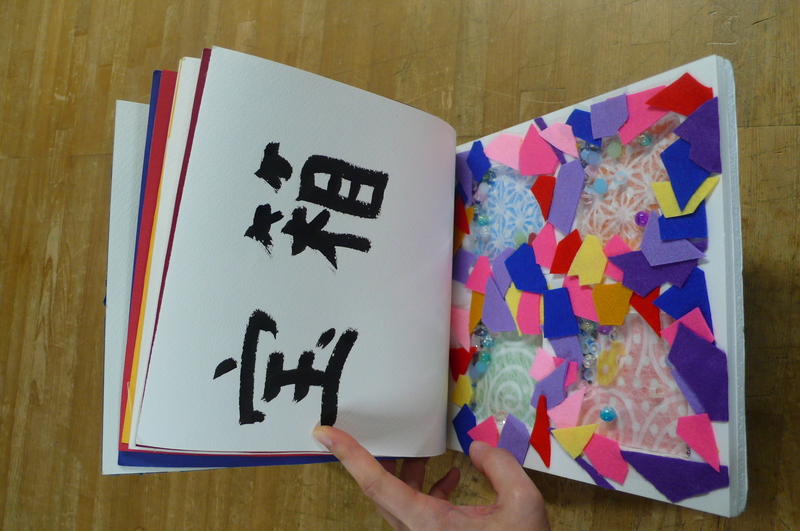 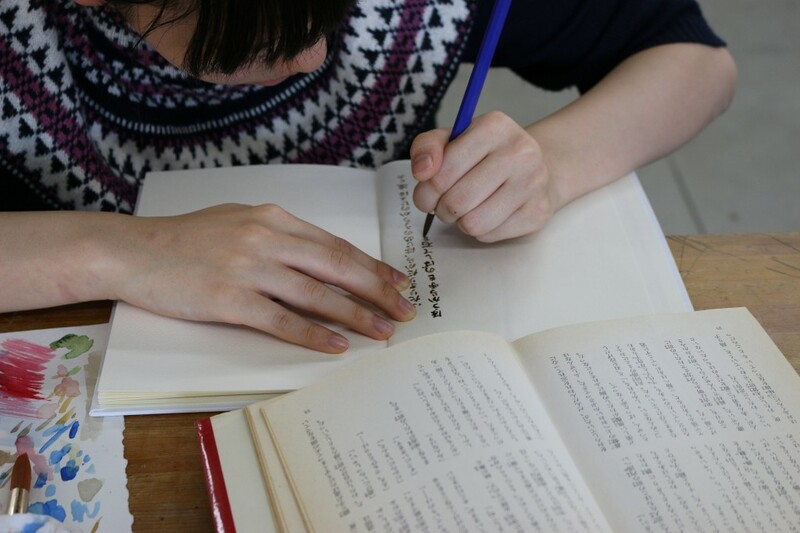 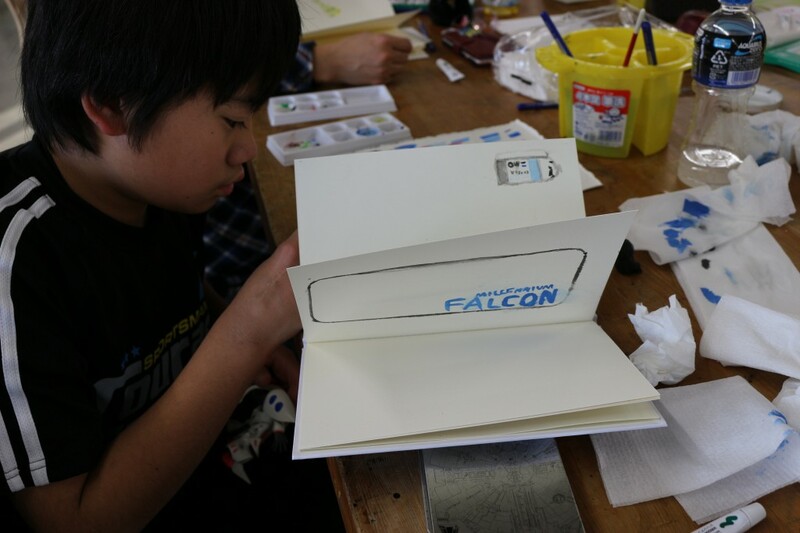 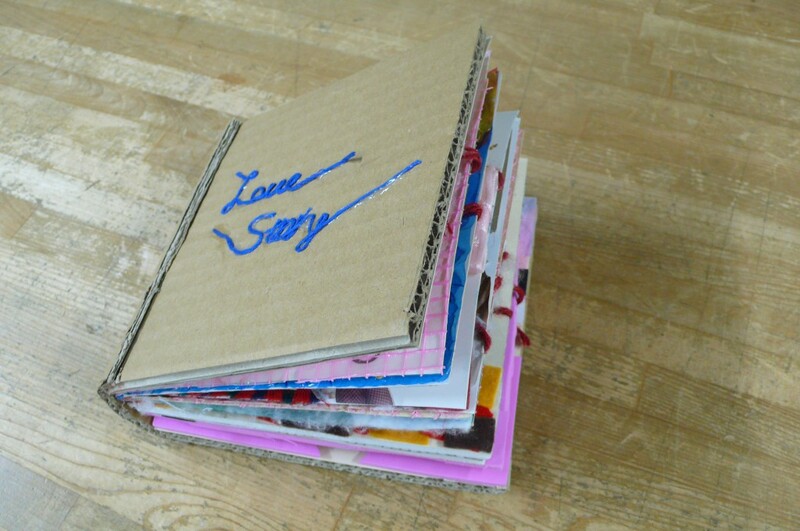 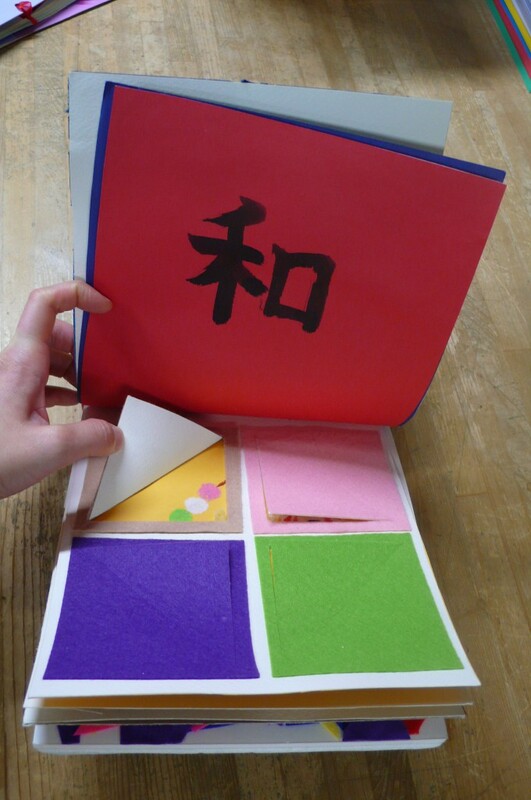 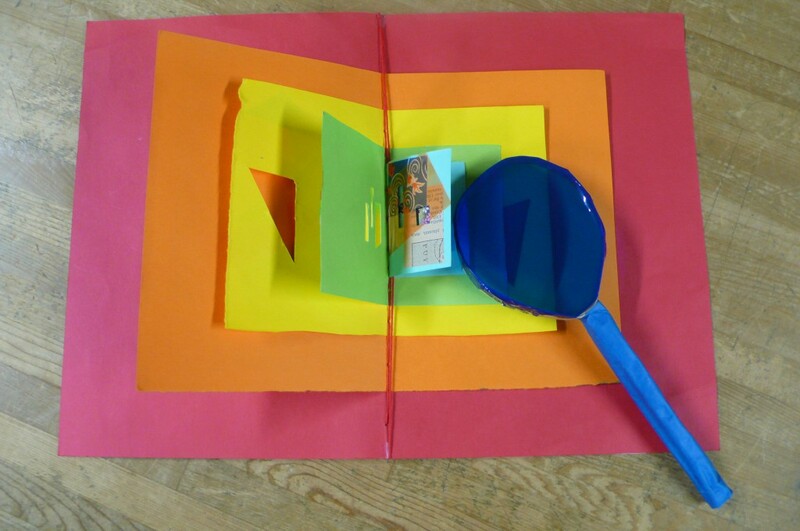 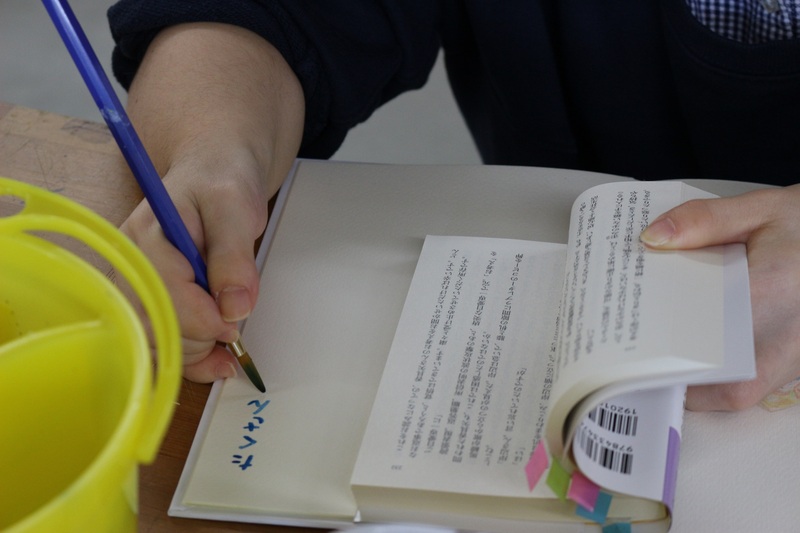 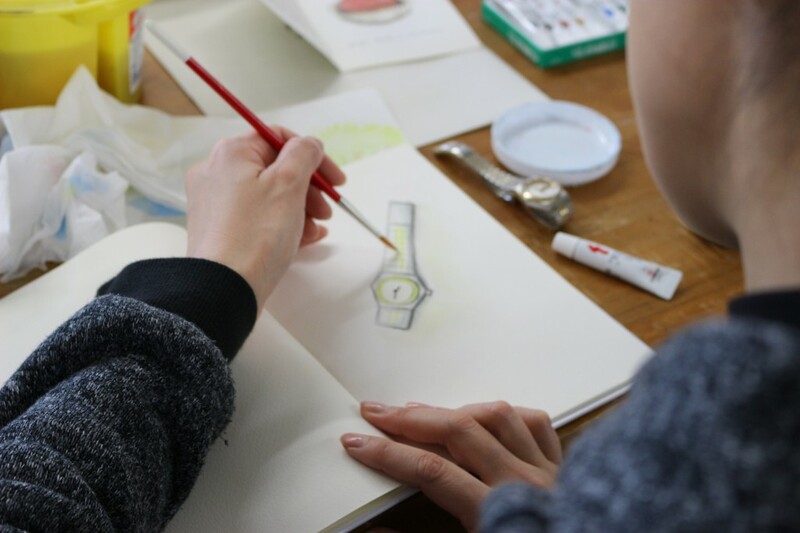 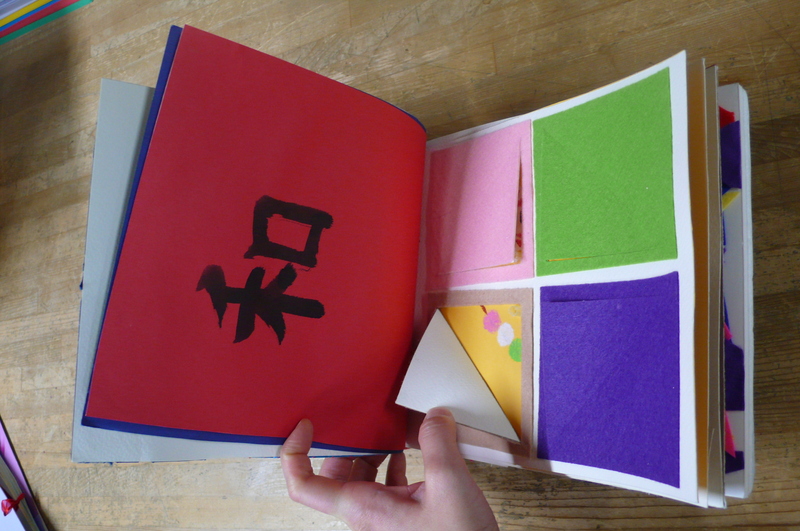 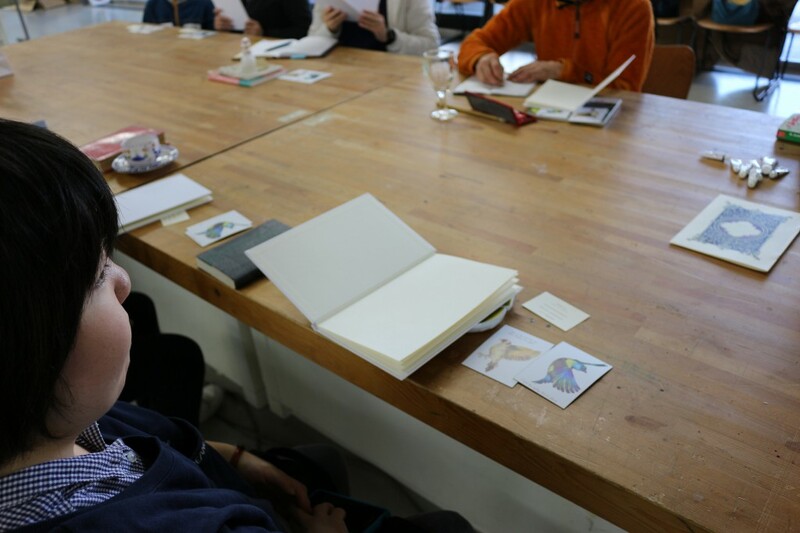 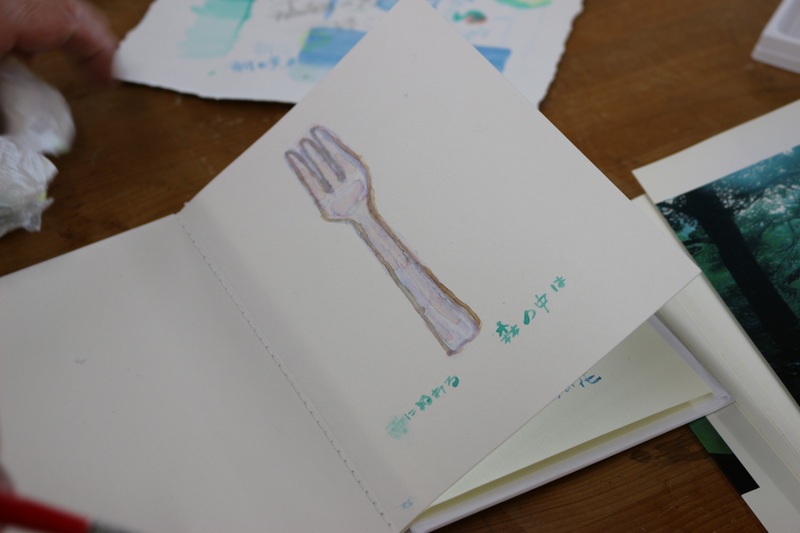 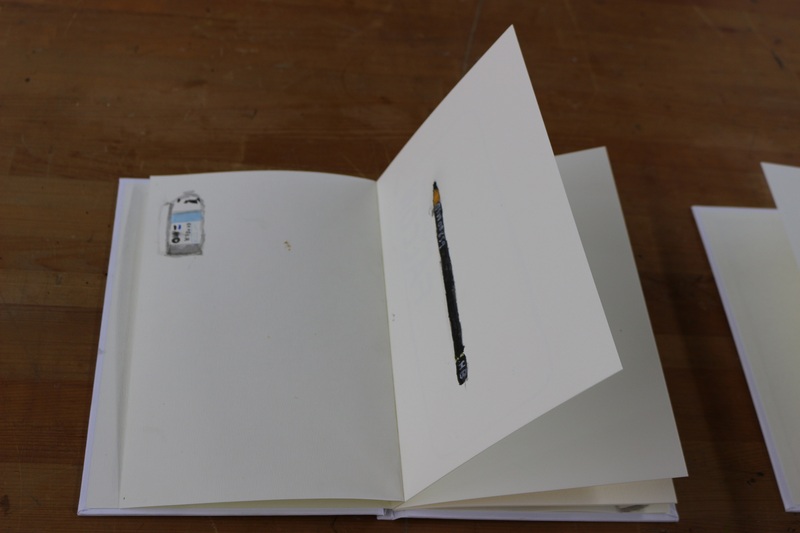 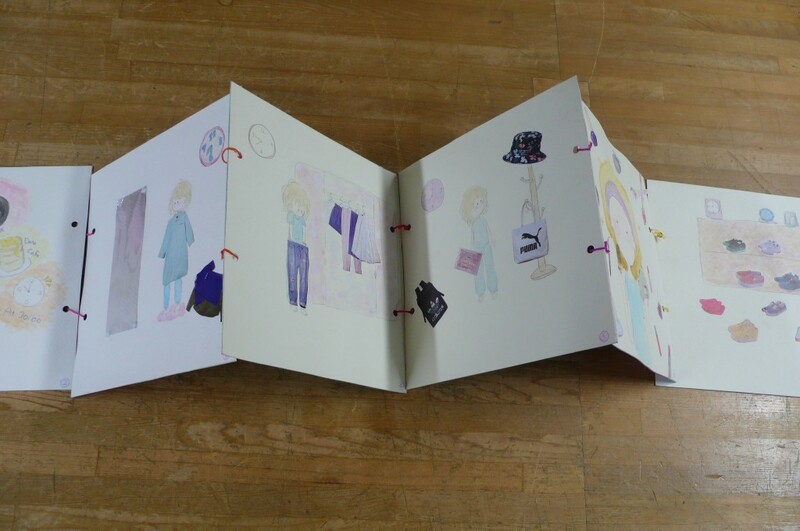 After few art classes, The students finished their own art books. 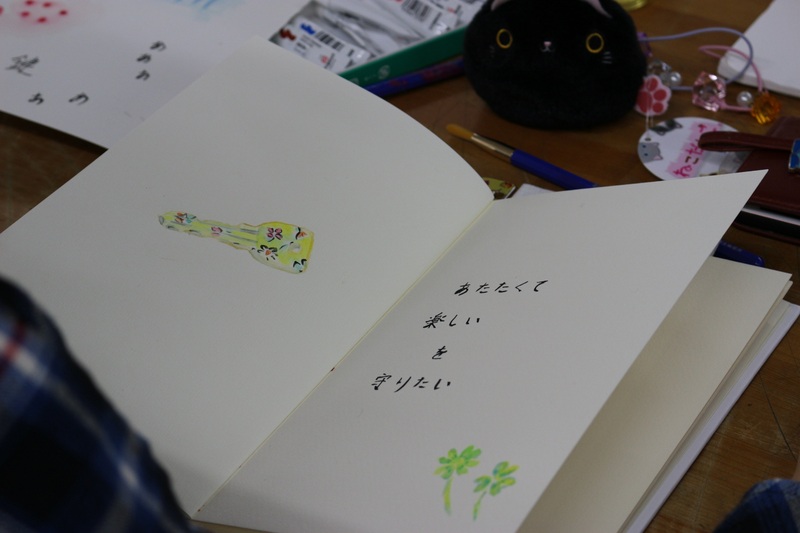 She started to talk about one family. 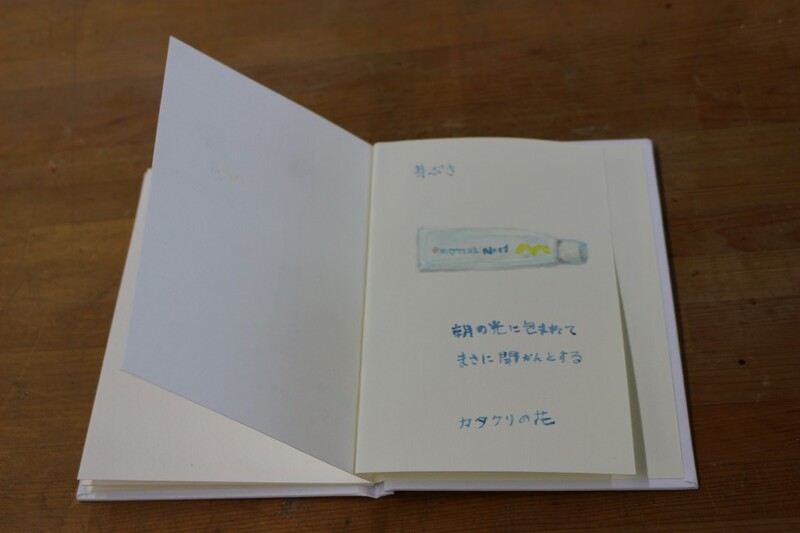 They are mother, fother and 8 children, And every summer they stayed liverside in 1 week with their children’s friend. 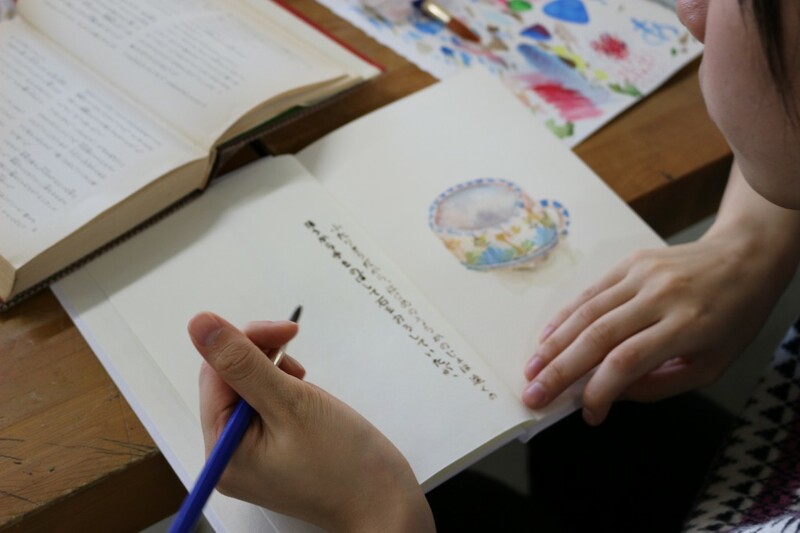 Lee was surprised about their volunteer to take care of many children, then started to think about what is memory or what is sharing the memory. 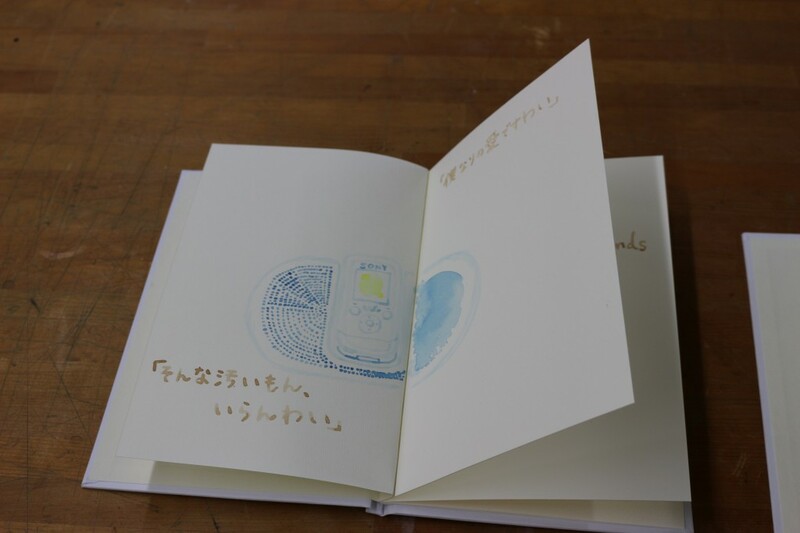 Home as a place of peace/ people go back, or How the people’s memory are documented/ gathered. 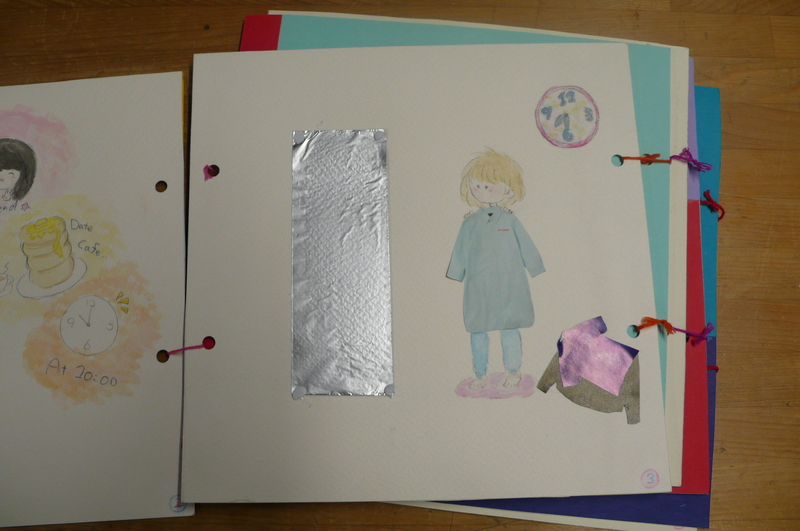 They are the theme of the Lee’s art work, and this story of the family seems represent her theme of artwors. 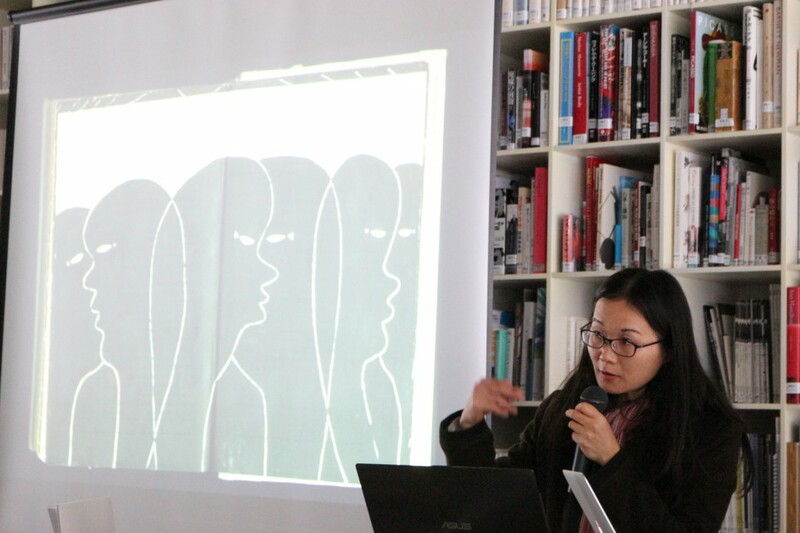 She also talked about the person who established the residency in Connecticut state, or the mmemory of her childhood during her lecture. 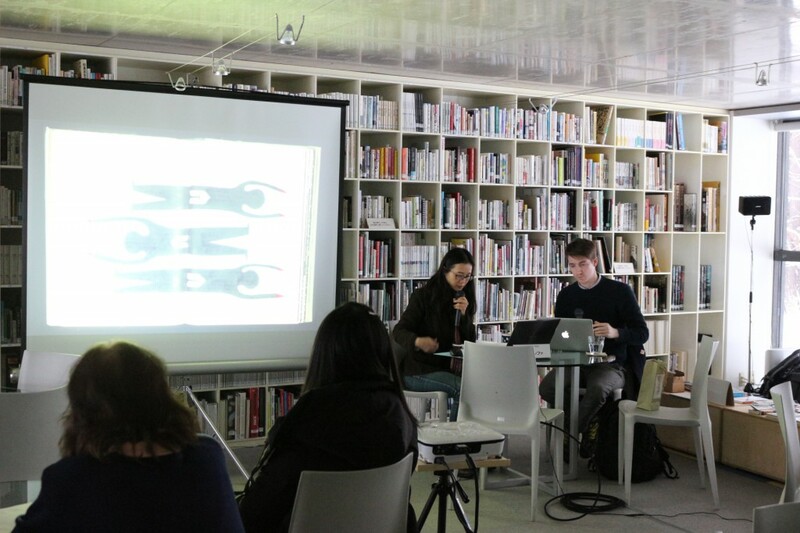 The audience listened between her personal story and the presentation of the artwork, and this experience was feeled like appriciated Lee’s another artwork. 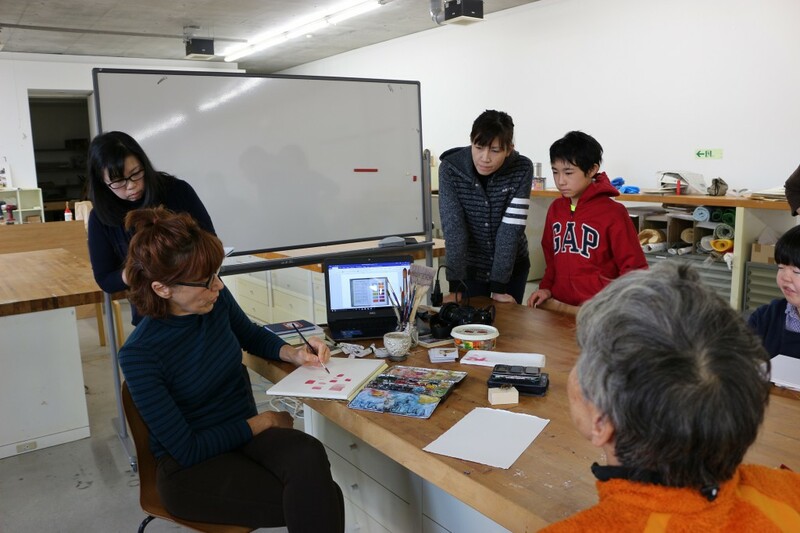 Renata CRUZ’s workshop was held on November 12th. 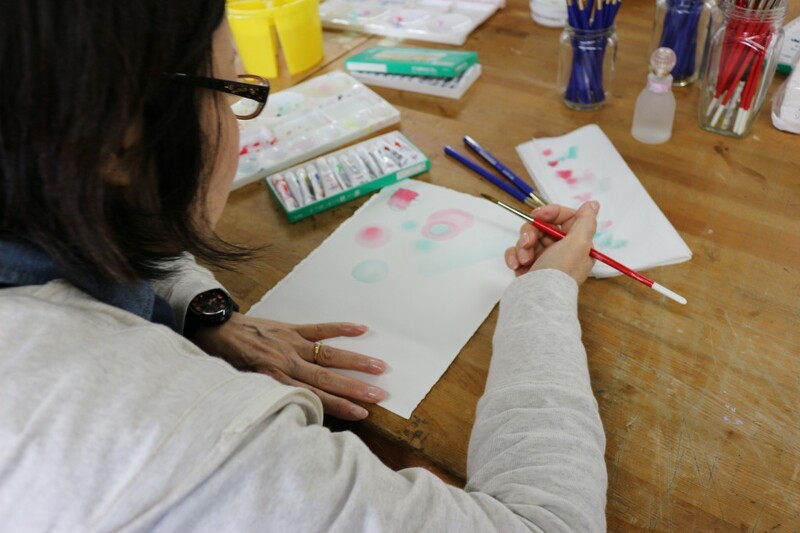 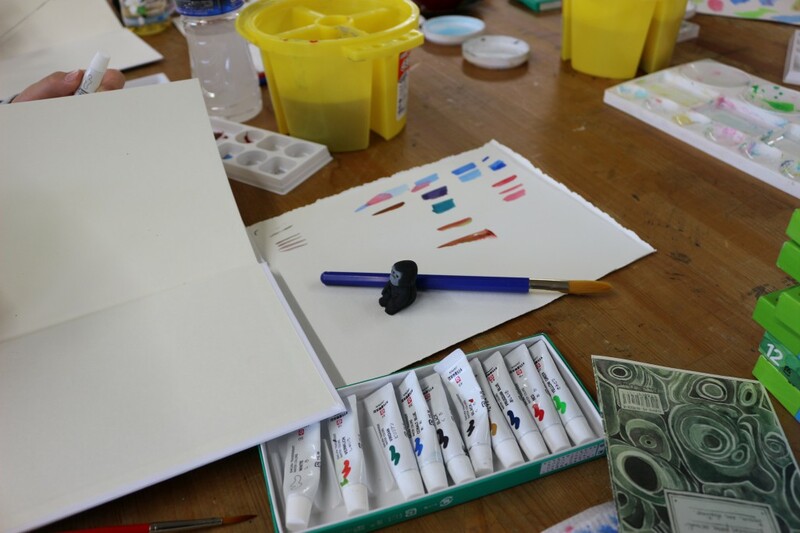 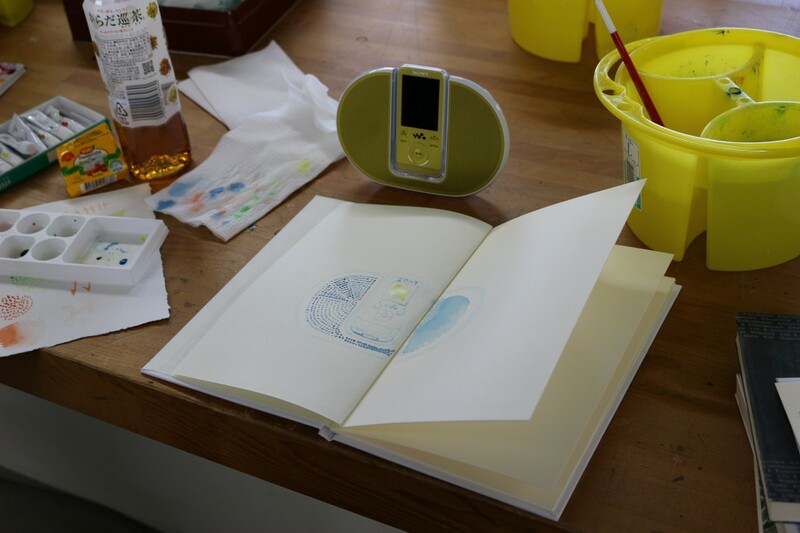 The participants used transparent water color, and painted on the books which made in Brazil by Renata in this workshop. 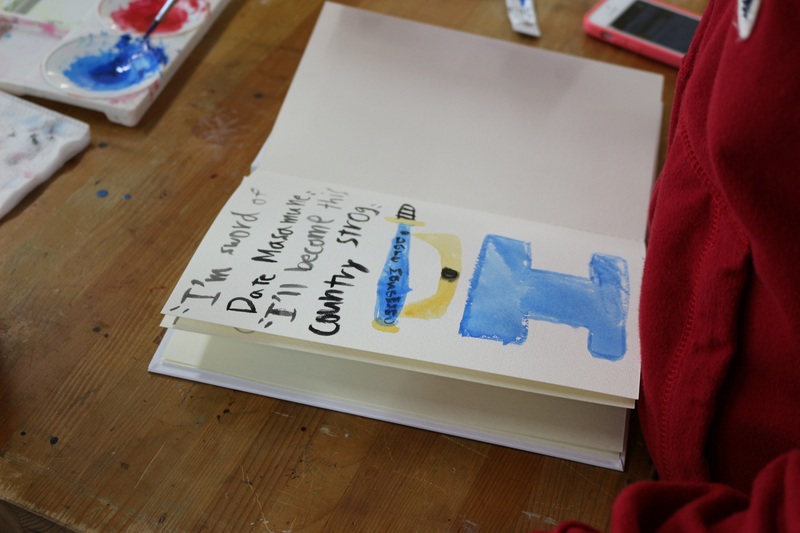 The participants painted the object from their home and the words or sentences by the books together. 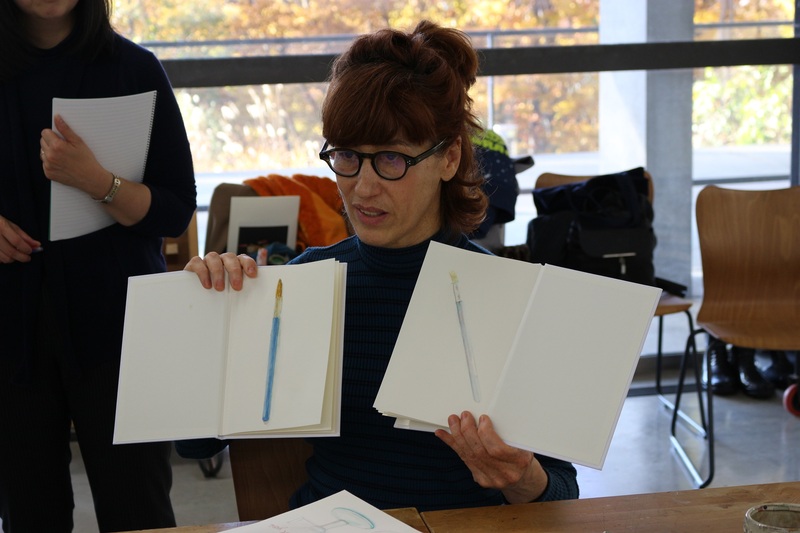 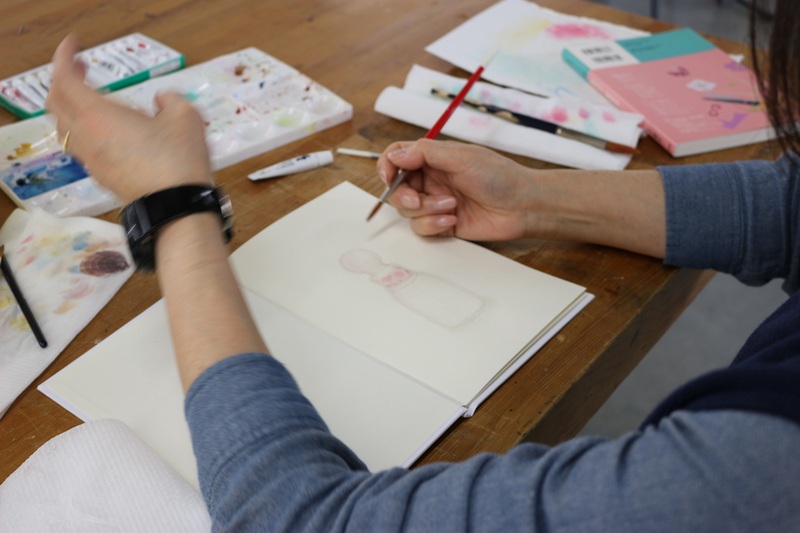 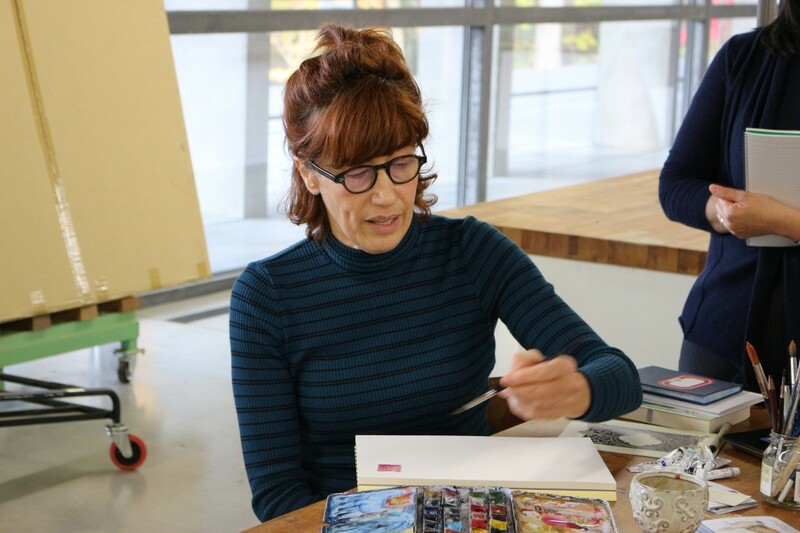 First, Renata explained about the transparent watercolor. 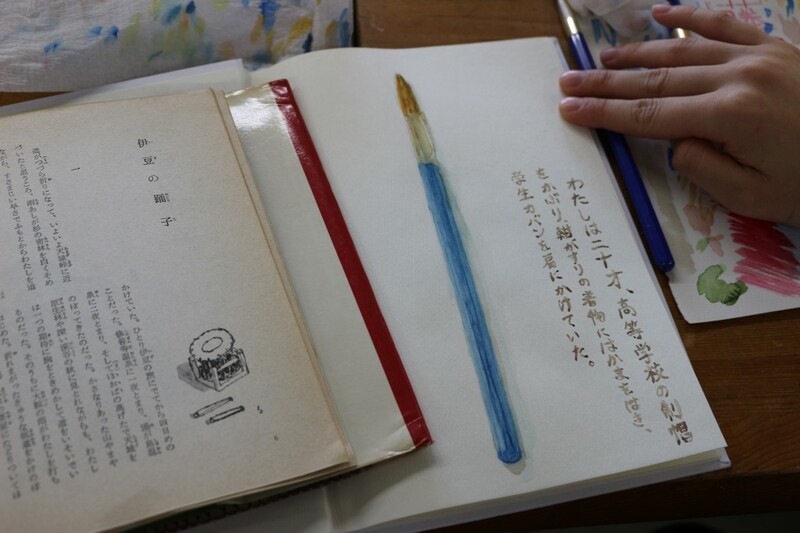 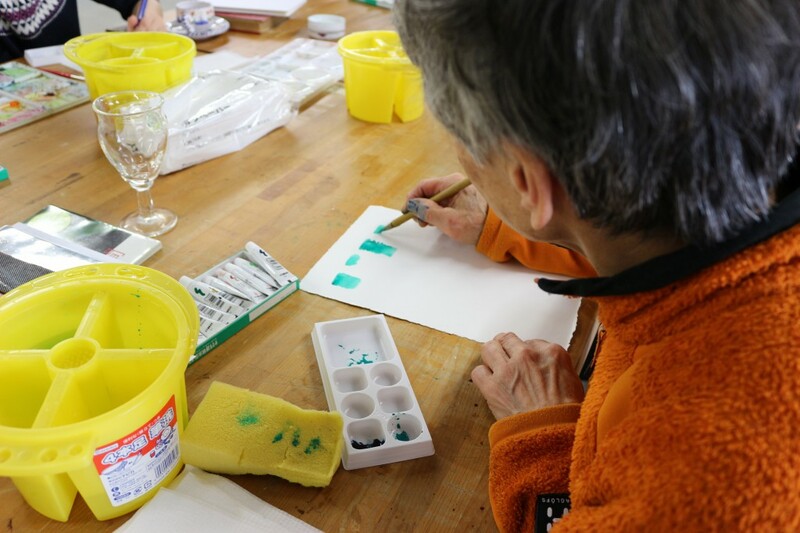 People are used to use opaque watercoplor in Japan, and the difference is how to paint the light tone. 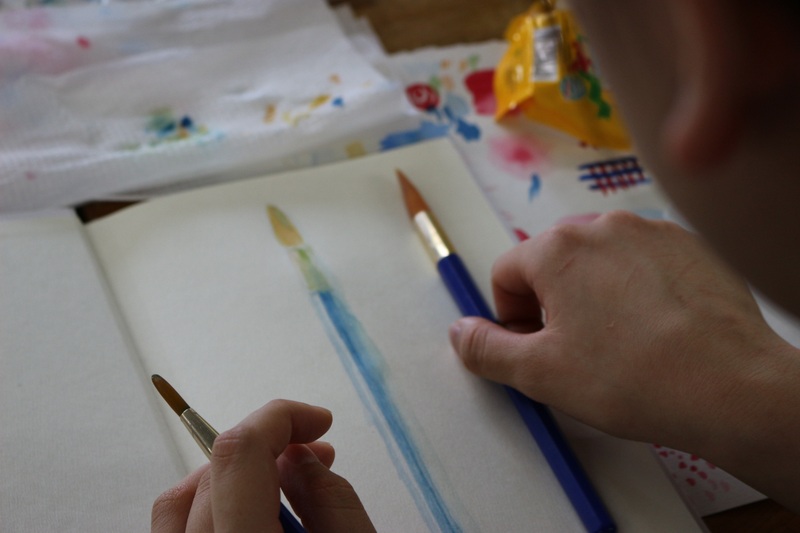 You mix with the white in opaque watercolor if you want to paint light tone, but you should mix more water in the transparent watercolor. 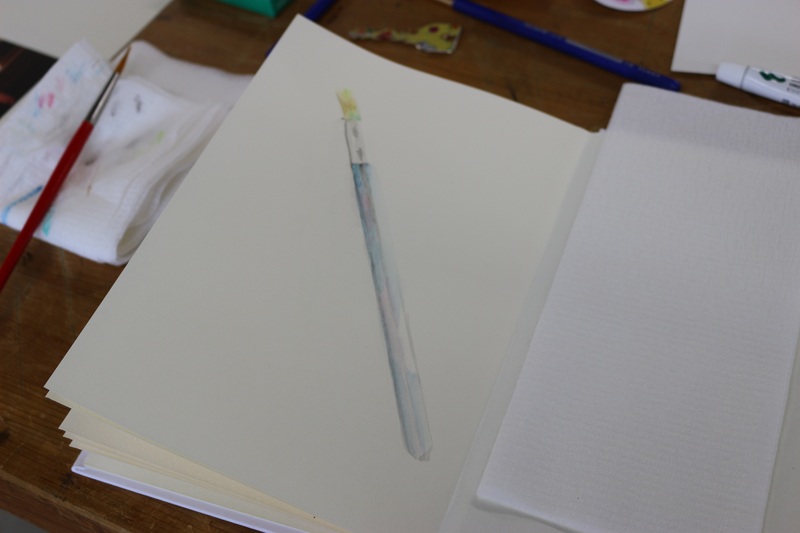 Also, you can enjoy the layer of the color in the transparent watercolor. 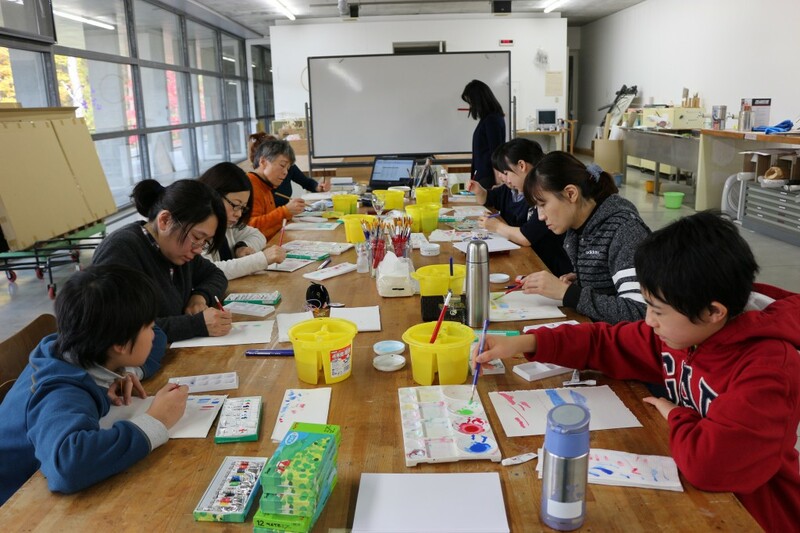 There was much times to practice how to use water and brush. 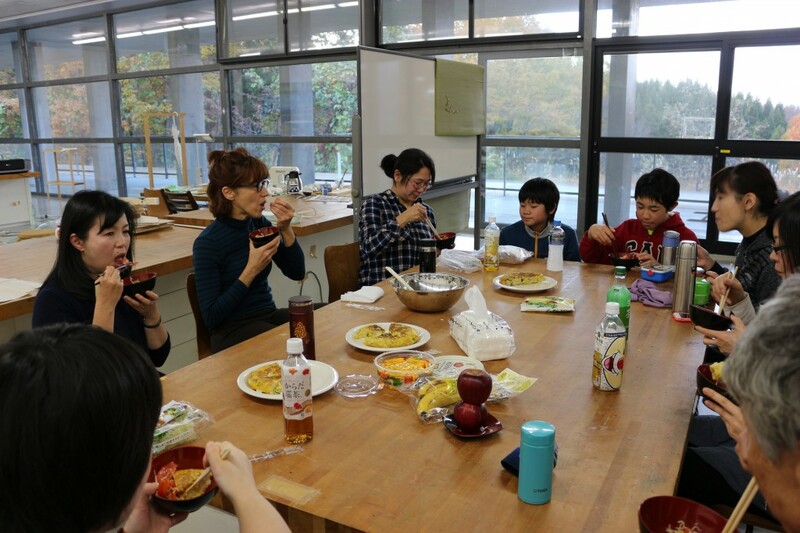 In the lunch time, Renata cooked Brazilian omulett and salad. 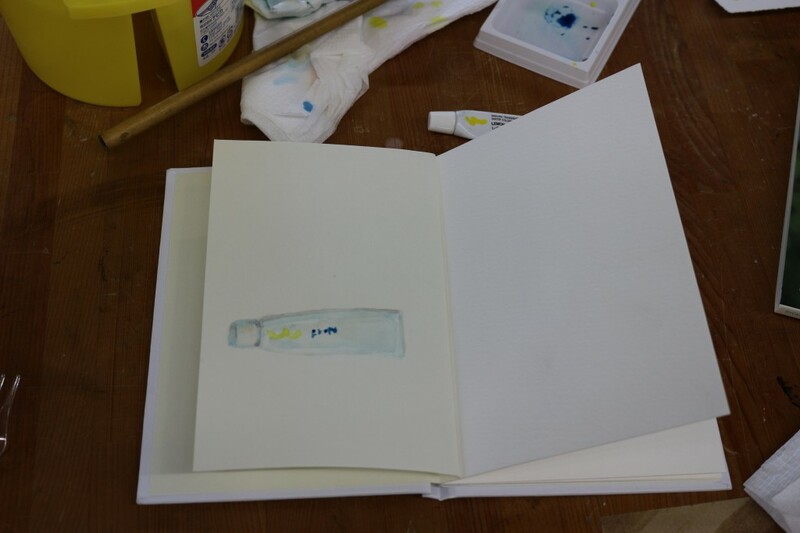 Then, started paint on the books. They painted same brush but were very different. 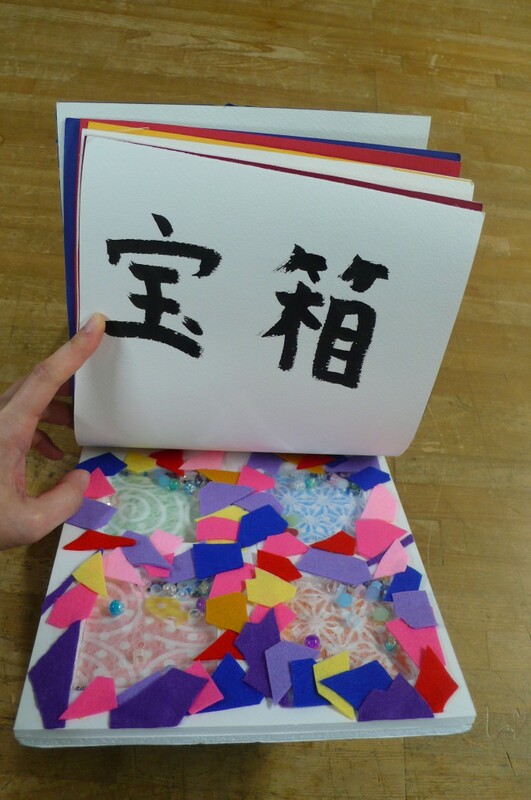 The last part is draw the words or sentences next to the object. 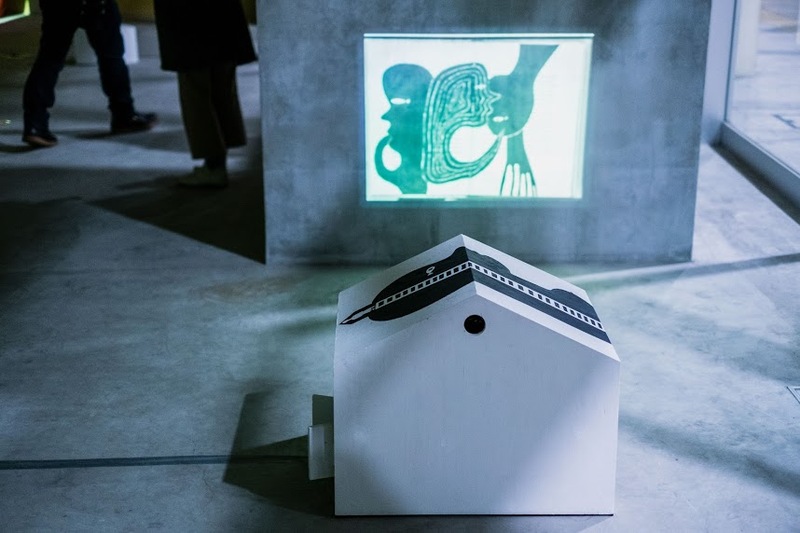 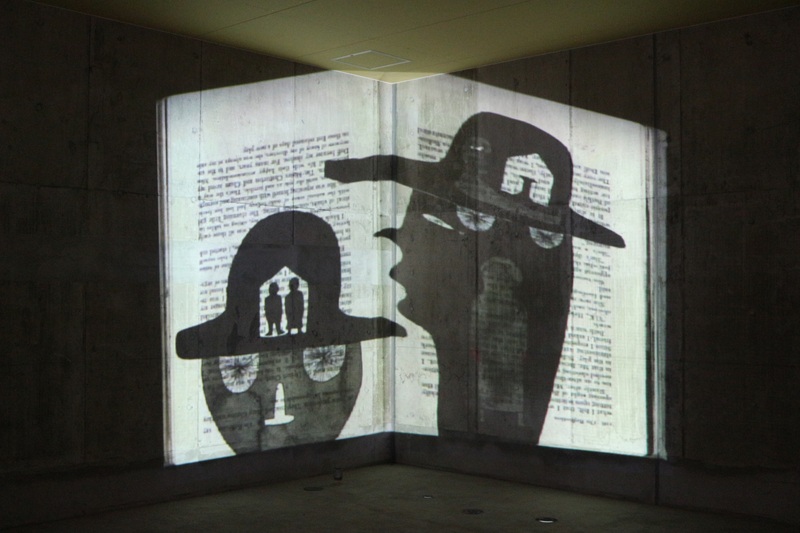 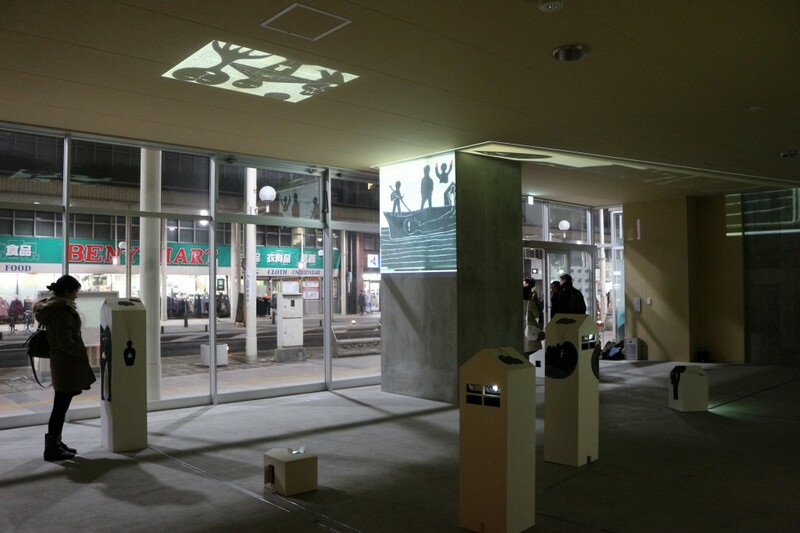 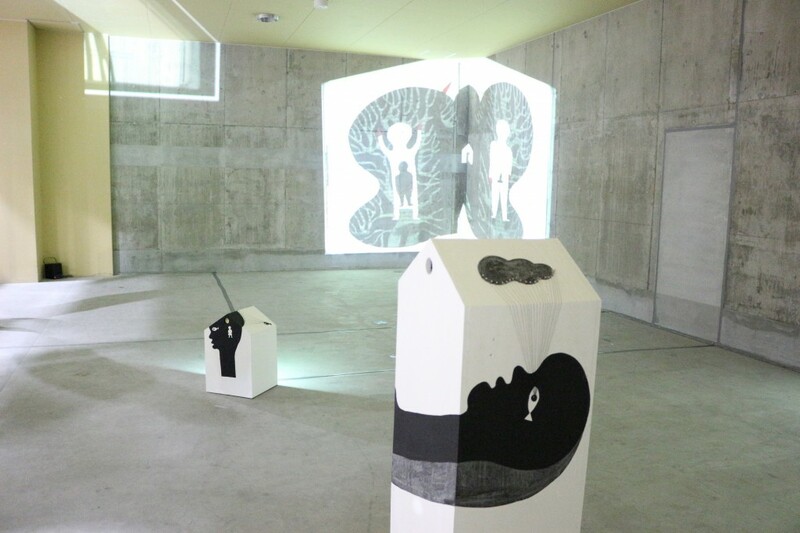 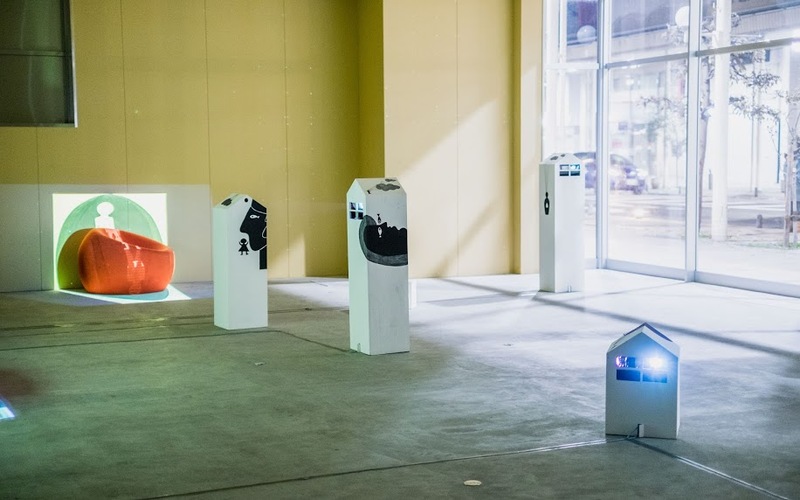 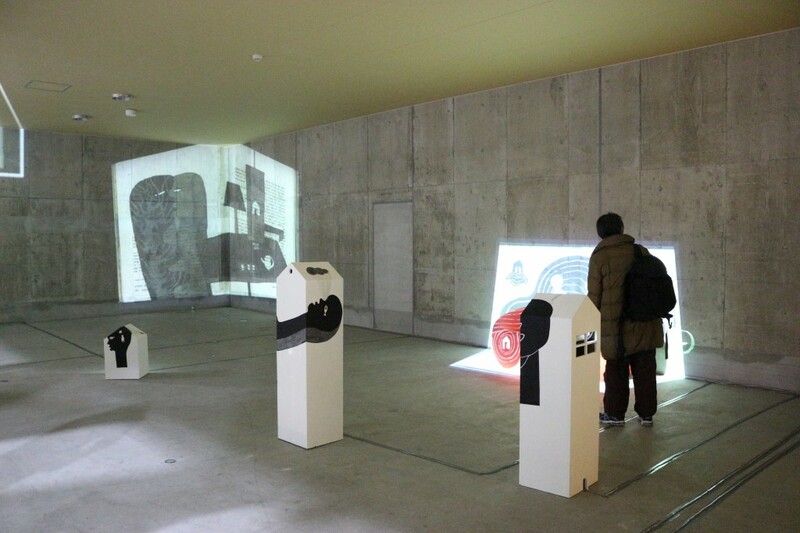 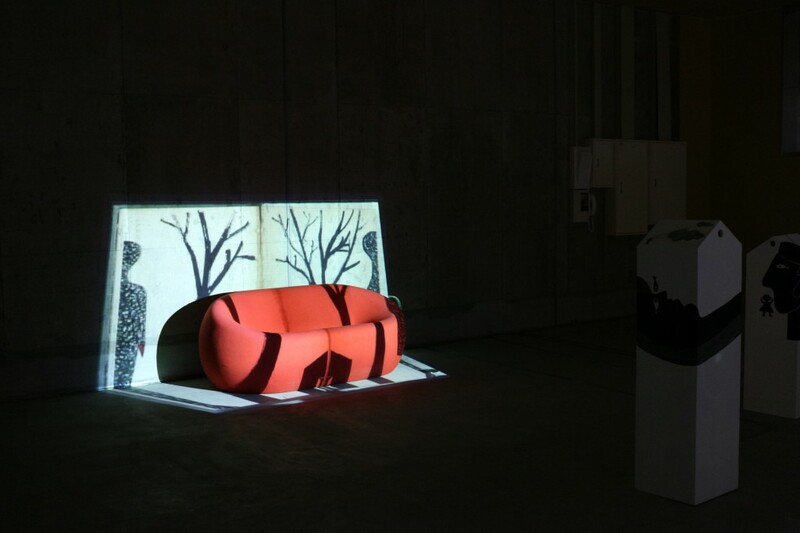 LEE Yen-Hua “Site Projection Project” was held in November 25th (Fri) at Shin-machi street, Aomori city. 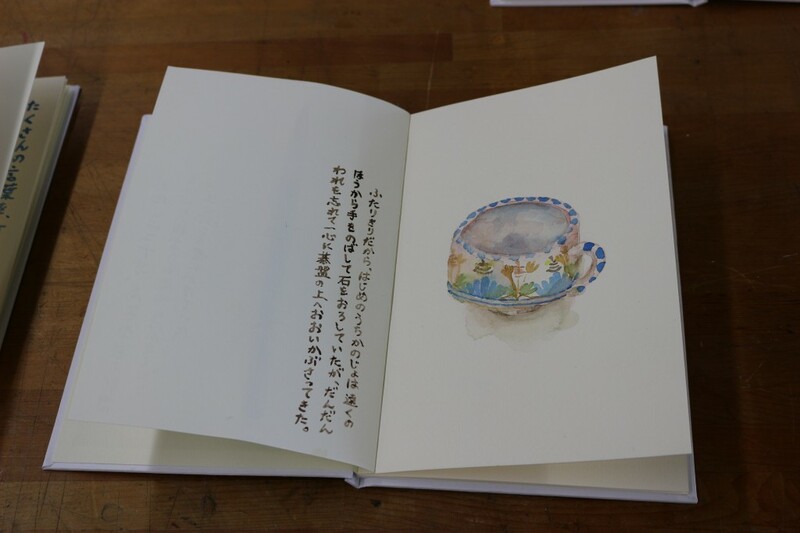 There were sound of leafing the book in the room, and the projection showed the drawings on the book.